Hello everyone! I made it home safely.. And, while I had an amazing weekend at the lake, I am always glad to return home. I passed out last night before 11 and didn't wake up til noon - and I'm not really one for sleeping! Insanity! I think it was because I got too much sun yesterday. We went for a little walk (maybe 20 mins yesterday) around another part of the lake (with ice cream, yay!) and I got burnt. Silly albino-esque skin tone!! I hope everyone had an amazing weekend as well! Speaking of being away.. I leave at 66 followers and return to 76? For serious?! Awesome! Welcome to all the new comers (: I hope I don't bore you to death! I was thinking of having a giveaway at 88 (fav number) but everyone 'snuck' up on me! We'll see, I will have to start compiling stuff soon!! I decided to be a part of Polish Hoarder Disorder's Bling challenge. I was pretty pumped about my entry! I loved every entry.. I went extreme and made a look that I would actually NOT wear in public - and there is very little that I would not wear on my nails - super fun!! This is my entry. So glittery and crazy! I will probably have another post ready either later today or tomorrow. My nails didn't get too damaged at the lake, but still, some chipping and it is not making me too happy!! I will do this cleaning business and laundry, then work on myself! Oh, and more aloe vera is needed - ouch!! 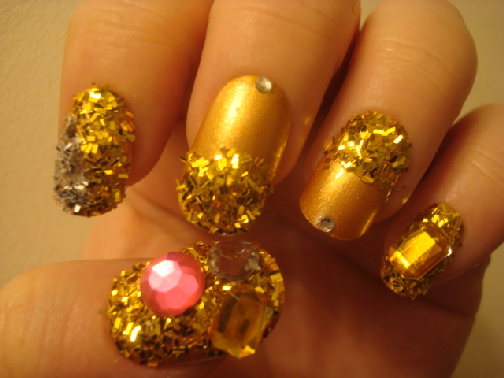 I LOVE your blingy nails!!! Sorry, I haven't been able to send HT yet but I'm going to try super hard to get it sent out this week. love ur blingy nails.. i always love ur creations!! Wow ! I loooove them !